23rd Annual Show! Entirely funded by local residents and businesses, so if you can spare it, please donate at the link above or you can mail them to P.O. 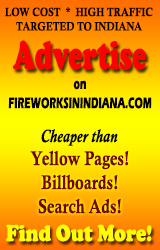 Box 118, Delphi, IN 46923 (make them out to Lake Freman Fireworks) Show will be accompanied to patriotic music; tune into K105. I’m afraid I don’t have a street address, so that map might not be precise.